Welcome to Sundays at Home week 93. Alice and I are so happy you’re here! Please link back for your chance to be featured next week! Link up your latest DIY, home decor, recipes, crafts, shop items and more! Here are the favorites from last week. All features have linked back to myself or Alice. Be sure to link back for your chance to be featured! Grab the button to share on your blog if you have been featured! -Post your home decor, diy projects, crafts, recipes, helpful tips, etc. that you shared recently on your own blog, as well as items you offer for sale on Etsy or other websites. Please try to make sure that they are new links that you have not shared here previously. 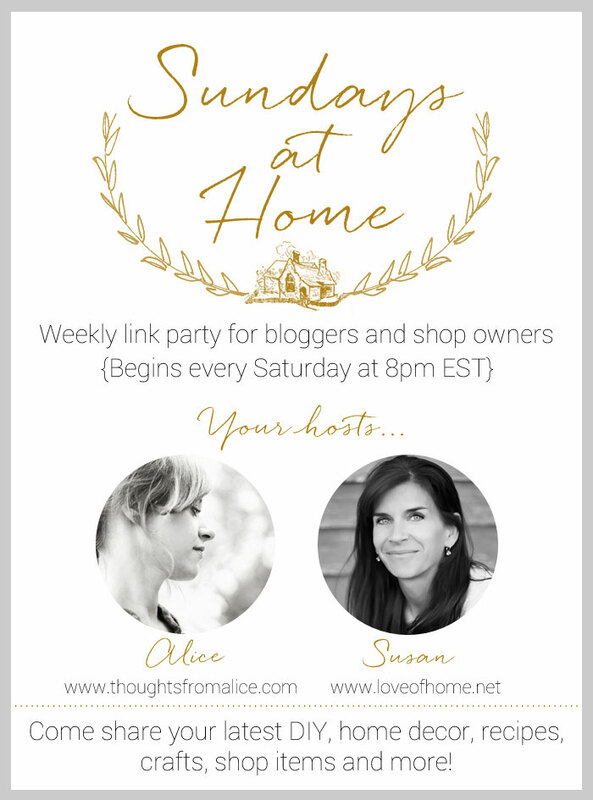 -Please have a visible link back to Thoughts from Alice or Love of Home somewhere on your blog (exception: items for sale). Only blog posts with a visible link back will be featured. -We hope you will consider following us in some way! -If you would like to pin any of the featured images, please visit the original source and pin directly from there. -By linking up here you are giving permission to possibly have your photo(s) featured at next week’s party, included in collage graphics, included in round-up posts by myself or Alice possibly outside of the link party day, and/or shared by us on social media (with full credit of course!) – Please don’t link up if you don’t agree to any of these terms! Thank you for joining us. We love featuring you! Thank you Susan for Sundays at Home 94. A pleasure to visit and join in. You’re welcome Lisa, thank you for linking up! Hi, Susan! I’m back after some break and love to be partying again with you! Thank you Kate, you too!! Thank you for the party, such pretty features! Thank you Jemma!! I had a nice weekend, hope you did too! You are welcome Julie, it’s lovely!! You’re so welcome Mary Jo!! Thank you for linking up we love having you! !